Santa Fe is teeming with historic and cultural attractions to add to your vacation itinerary! One of our favorite of these is the New Mexico Museum of Art in Santa Fe. Here, you will discover a flourishing catalyst and showcase for creativity. At the New Mexico Museum of Art, you will find authentic experiences that foster a deeper understanding and enjoyment of both regional and international art. Come visit and discover one of the most popular cultural attractions in this beautiful place we call home! Find out more about all of the great cultural and historic attractions near Four Kachinas Inn when you download our free Vacation Guide. It’s full of the best recommendations for things to see and do, like enjoying a visit to the New Mexico Museum of Art in Santa Fe! The New Mexico Museum of Art building only dates back to 1917, but its architecture looks to the past. The design is based on the 300-year-old mission churches at Acoma and other pueblos. Built in the Pueblo-Spanish Revival style of architecture, the museum blends Native American, Hispanic, and European-based cultures into a unique body of work. Discover the graceful simplicity of the facade and the vibrant cross-cultural collection within its walls during your visit! Once within its walls, you will discover the unique collection of artwork that draws hundreds of thousands of visitors each and every year. Alternating and permanent exhibitions create a sense of imagination and wonder as you wander throughout the New Mexico Museum of Art in Santa Fe. Discover everything from contemporary photography to Post-War American paintings. You will love the Southwestern sampler, with snippets from the permanent collection. You will also be able to immerse yourself in the work of a featured artist in the Alcoves, which feature one artist’s work for five weeks before moving onto the next. 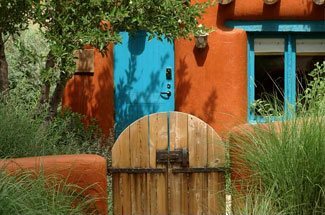 Our charming Santa Fe bed and breakfast creates an unforgettable authentic experience that you will love during your visit. Here, you will discover a relaxing atmosphere with luxurious amenities. Our garden courtyard allows you to rejuvenate with a good book or cup of coffee, while our rooms feature modern amenities blended with Southwestern decor. Vaulted ceilings, saltillo tile floors, Native American artifacts, and Western-style fixtures are just a few unique touches. Our one-of-a-kind bed and breakfast also features local folk art and paintings along with Spanish Colonial art and furniture. 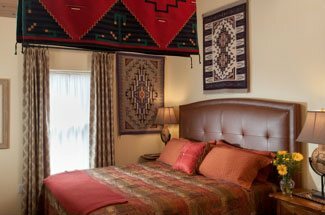 Discover a taste of our multicultural city when you stay at Four Kachinas!